If you're not interested in sharing certain files or information with other people who use your computer, you may want some privacy. Easy File Locker is one tool which provides just that. The program itself is extremely small in size, but it is able to effectively lock and hide files you feed it behind a master password. It can deal with multiple files or entire directories. Version 2.2 is a freeware program which does not have restrictions and it's free so it doesn't cost anything. For security reasons, you should also check out the Easy File Locker download at LO4D.com which includes virus and malware tests. Additional screenshots of this application download may be available, too. 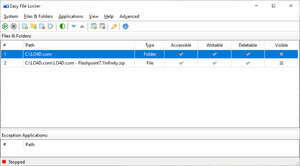 Easy File Locker has a presence on social networks.